Can you believe this weather? When Spring finally came, it came in a big hurry, and I’m in love! I’m in love with the sunshine. I’m in love with the white flowers of my cherry tree floating through the air. I’m in love with the fragrances of the flowers, and I especially love with playing outside with my granddaughter. 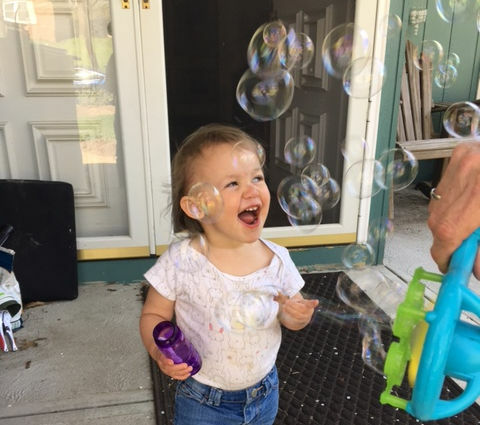 Outside is her favorite place to be, and blowing bubbles is her favorite pastime. 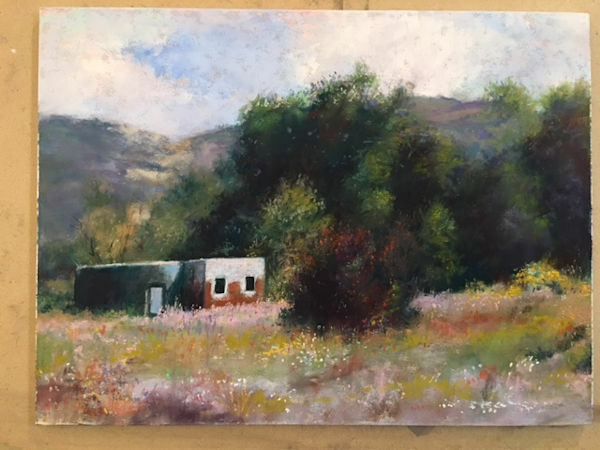 I don’t remember if I’ve mentioned it to you or not, but this year I’ve been serving as president of the Pittsburgh Pastel Art League. It’s a real challenge for someone (like me!) who is really lousy with administrative work. But so far, so good. I’m really enjoying it, and the group seems to be having a great time. 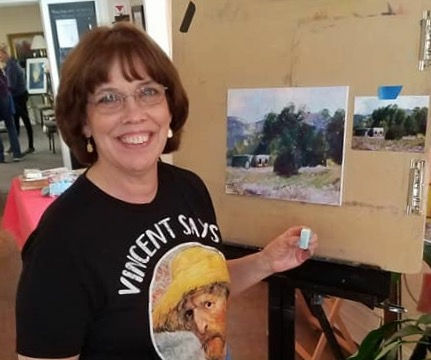 Last Saturday we had planned a “Paint-Out” at the Gilberti Gallery in Coraopolis from 9 to 3, meaning we would be painting outdoors in the community. Well, at 9 a.m. it was raining cats and dogs. I had no clue how many people would actually show up. My original plan was to help everyone set up, then rush home and get back to work on painting the Forbes Hospital piece (I’m on the fourth painting out of five). I wasn’t planning to actually participate in the Paint-Out myself, so I didn’t bring any materials with me. I had to leave early, and that was that. Artists began to show up, and as their numbers grew, I got more and more excited. We decided to move the event inside the gallery, and we began to set up painting stations. Cindy even had all the easels we needed to make it happen. People showed up with food to share and plenty of excitement at the prospect of painting together. Artists came from all over to join in the painting party… artists from O’Hara Township, Indiana Township, Westmoreland County, and elsewhere. She didn’t have to ask me twice. My inner painter said, “To heck with going home, I’m going to stay here and paint!” I don’t get as much downtime for fun as I would like to, and when I get the chance, I call it “Bingo Night” – remembering the times when I was a little girl and my grandmother would take me with her to Bingo! It was my idea of honest-to-goodness fun. Anyway, Cindy, the gallery owner, is terrific, and just getting to hang out with her any time is in itself a real joy. So I started painting. It felt so good and so liberating to paint something beautiful just because I wanted to – with no commitments! I picked a photo of New Mexico, similar to a scene I remembered from last June when Tom and I spent a couple of weeks there after the pastel convention. In the end, I was truly glad I stayed to spontaneously create art with my new friends. It was like a breath of fresh air. I hope you also are having a beautiful week and doing what you love to do.